Ambrosia Tisdale is the very picture of propriety and the epitome of what a respectable young lady should be. Haunted by a memory and compelled by her family, she pursues perfection to a fault. The Earl of Bristol, Duncan Maddox, has returned to London after years of familial imposed exile. As the second son, he has led a life filled with frivolity, leisure, and a healthy dose of debauchery. Now his older brother has died, leaving the family’s flailing legacy in Duncan’s unwilling arms. At the behest of his uncle, Duncan is advised to do the one thing that could provide instant fortune and respectability—he must marry. But there is only one prospect who meets the unique requirements to solve all the Earl’s problems—the lovely Miss Ambrosia Tisdale. But securing the prudent daughter of a Viscount’s hand proves to be more challenging than this scandal-ridden second son of an Earl has bargained for. With scandal, extortion, treachery, and even love itself threatening to keep him from his goal, will Duncan succeed or find himself compromised by Miss Tisdale? She had stumbled upon the library. A fire in the hearth threw a faint glow over leather lined volumes that filled floor to ceiling book shelves. Lavishly upholstered plush arm chairs sat upon Aubusson rugs scattered throughout the room. A settee was positioned across from a giant stone faced fireplace where a shirtless man sat warming his hands. Certainly, her eyes were playing tricks on her. Then the shirtless man turned his head, his eyes meeting hers. It wasn’t a hallucination-he was real. She hadn’t been expecting to find a partially dressed man, and he obviously wasn’t expecting to be found. It was but a moment before the man’s expression began to soften and a wicked smile slowly crept across his lips. A smile that stole the breath right from out of her. Every gently bred fiber in her body screamed to turn around and run straight out the door. Hundreds of years of proper English rearing had produced a base instinct to flee when in the presence of an unknown male (especially one with so little clothing). But then he stood up, cautiously, the way one does as if not to startle a deer. Standing, he was clad in nothing but buckskin breeches, the dim light from the flames playing over the sculpted muscles and sinew of his shoulders and chest. Breeding be damned, her feet simply refused to budge. Jessica Jefferson makes her home in northern Indiana, or as she likes to think of it – almost Chicago. Jess is heavily inspired by classic sweeping, historical romance novels, but aims to take those key emotional elements and inject a fresh blend of quick dialogue and comedy. She invites you to visit her at jessicajefferson.com and read more of her random romance musings. Compromising Miss Tisdale available now on Amazon! Taming Miss Tisdale coming Spring 2014 from Soul Mate Publishing! Remember the old Beach Boys song, I get around? That’s how I’m feeling right now. Thursday Threads – Hey, it’s me! One Line Hook: The son of the Thunder God, Thor, has a lot to live up to…and no time for love. The man looked like a god. Then again, he was one. . .
Jord Thorson was a god– the son of Thor, the Norse God of Thunder. In his search to find his missing father, Jord seeks out the mortal, Meghan Larson, who is in possession of his only clue–Megingjörð, Thor’s magical belt of power. But when the belt decides to take matters into its own hands, locking itself around Meghan’s waist, Jord and Meghan are plunged into the middle of a massive conflict that rages across the heavens. Giants, magical artifacts, and a golden city in the clouds weren’t exactly what Meghan Larson expected when that amazing belt arrived at her museum. Now Megingjörð is stuck around her waist and talking to her in her head. She’s got to be dreaming, but with the wonders around her and hunky Jord Thorson at her side, Meghan’s not sure she wants to wake up. The rainbow ended on a street that appeared to be paved with silver stones. Jord pulled up to the first building, a tall tower of a structure. As he turned off the cycle Meghan jumped from the seat and swatted his shoulder. “You might have warned me a bit, about what to expect.” Her heart was still racing, but now that her feet appeared to be on solid ground again she felt herself calming down. Had anything that had happened to her lately been believable? A large man in blue jeans and a black t-shirt with an ornate sword belt strapped around his waist leaned on the doorpost of the tower entrance. He had short blond hair and a very full beard. The sword at his side had to be almost four feet long. He was smiling and waving. “There isn’t anything you haven’t heard, Heimie.” He patted the man on the shoulder. I just completed the new video trailer for Seeds of Immortality. Someone posted the following quote on Facebook this morning, and I thought it was appropriate considering Collette Cameron’s give-a-way that I’m part of. 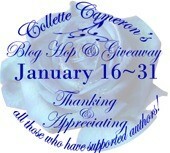 As I mentioned in an earlier post, Collette is hosting a contest to celebrate her one year of blogging. She is also an award-winning author, so check out her website. Along with twenty other Soul Mate Publishing Authors, we are giving away a Kindle Paperwhite,copies of our books, (both e-books and paperback) and other bling. I’m giving away two e-book copies of “Riding for Love.” The book won’t be out in paperback until March, so I can’t do paperback. Right now she’s got some really fun prizes available to win.